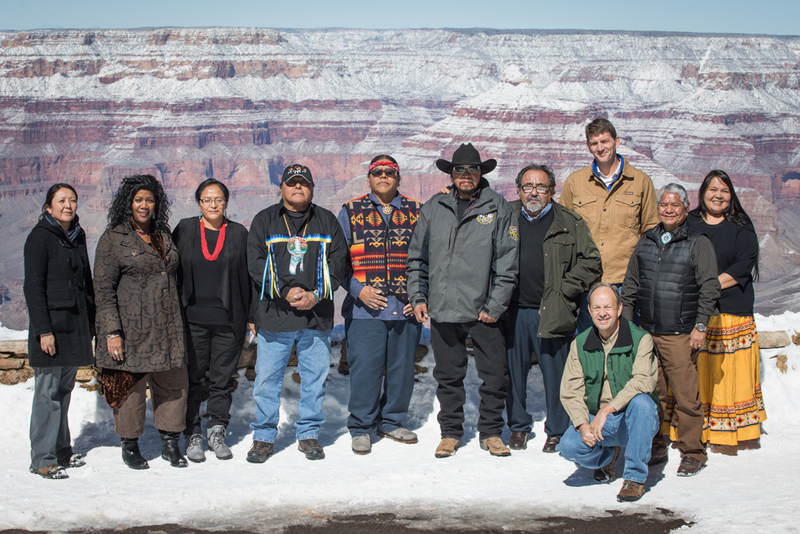 GRAND CANYON NA, AZ — Today, Arizona Representative Raúl Grijalva joined elected officials and tribal and community leaders to announce new legislation to ban new mining claims on approximately 1 million acres of public lands surrounding Grand Canyon National Park. Grijalva will introduce the Grand Canyon Centennial Protection Act on February 26, the national park’s 100th anniversary. After visiting the canyon’s snow-draped south rim, Grijalva said, “When I get back to Washington, I’m introducing the Grand Canyon Centennial Protection Act. It makes the current mining moratorium around Grand Canyon National Park permanent. It takes the crown jewel of this state, and our country, out of political hands once and for all. It says no more debate. Keep the Canyon great." Havasupai Tribal Council member Carletta Tilousi added, “We are just following in our ancestors' footsteps to protect this canyon. Please stand with us...today is a very important day, a historical day, as we continue to work together to stop uranium mining in the canyon forever. Forever." The Act would make permanent a temporary ban on the same federally managed lands that the interior secretary closed to new mining claims in 2012. Havasupai leaders and a broad coalition of elected officials, businesses, and conservationists supported the 20-year moratorium because uranium mining has been contaminating water and the surrounding landscape for more than a half century. “As a matter of principle and common concern,” concluded the Grand Canyon Trust’s executive director, Ethan Aumack, “we proudly join with citizens — of many political persuasions and personal histories — to stand with one united voice in supporting the Grand Canyon Centennial Protection Act." Rep. Grijalva with supporters of the Grand Canyon Centennial Protection Act of 2019, south rim, Grand Canyon National Park. "Today is a very important day, a historical day, as we continue to work together to stop uranium mining in the canyon forever."